The A2 features 5 horizontal cutouts equally spaced with compensation - no bottom porting. The RV3 Reverse Venting muzzle Brake offering a huge 70% recoil reduction with compensation. THE DOMINATOR Reverse Venting muzzle Brake offering a huge 70% recoil reduction with compensation. Multi-port brake softens felt recoil and reduces muzzle rise. A single expansion chamber and 30 total ports, provide maximum recoil control. The Triple-Tac1 Muzzle Brake Compensator features 3 large expansion chambers which dissipates then directs the gases to the side , up and rear through the precisely canted vents. Highly efficient reverse venting design reduces recoil and blowback while eliminating muzzle jump. Closed in bottom compensator greatly reduces the dust signature & will not throw dust up. This not only provides maximum recoil reduction but also reduces the torsional recoil force associated with heavy bullets and fast twist rates. Machined from high strength steel. High pitch diameter tolerance class 3B threads machined in the same operation as the bore ensures a perfect concentricity, this combined with a progressively decreasing baffle thickness and maximized venting area significantly reduce bullet flight disturbance resulting in less yaw, higher BC, and improved accuracy. 14x1mm thread 58mm OAL, 22mm dia, .73.7g. Machined to suit your cal. 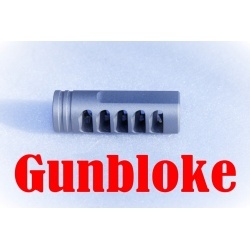 Reduces muzzle blast, Reduces Muzzle Jum and helps dissipates gas for more control during shooting. The TAC-XTREME Muzzle Brake & Compensator provides maximum recoil reduction with reduced muzzle blast. Shooters, you can now watch your shots hit the target with no Dust Blow Ups! Also includes crush washer to suit in Cerakote. Innovative Removable Blast Shield directs gases & sound forward. The main body is Machined from high strength steel & with a removable solid shield & top vented shield. Also includes lock nut to suit in Cerakote. The RV3 Muzzle Brake Compensator features 3 large expansion chambers which dissipates then directs the gases to the side and rear through the precisely canted vents. This not only provides maximum recoil reduction of approx 70% but also reduces the torsional recoil force associated with heavy bullets and fast twist rates. 65mm OAL, 24mm dia, 126gr. 14x1mm or 5/8x24 thread 58mm OAL, 22mm dia, .73.7g. THE TANKER is designed specifically for high precision rifles and long range hunting rifles. 3 large symmetric baffles, each featuring 2 horizontal ports & 2 vertical compensation port, redirect a massive volume of gas away from the bore axis. The Closed bottom in compensator greatly diminishes dust signature. 14x1 thread featuring High pitch diameter tolerance class 3B threads machined in the same operation as the bore ensures a perfect concentricity, this combined with a progressively decreasing baffle thickness and maximized venting area significantly reduce bullet flight disturbance resulting in less yaw, higher BC, and improved accuracy. You can watch your shots hit the target. High-precision barrel threads for optimum thread interface - 1/2x28 TPI thread featuring High pitch diameter tolerance class 3B threads machined in the same operation as the bore ensures a perfect concentricity, this combined with a progressively decreasing baffle thickness and maximized venting area significantly reduce bullet flight disturbance resulting in less yaw, higher BC, and improved accuracy. Pecision machined from high strength steel bar. Multi-port brake softens felt recoil and reduces muzzle rise. A single expansion chamber and 39 total ports, provide maximum recoil control. 14x1mm or 5/8x24 thread featuring High pitch diameter tolerance class 3B threads machined in the same operation as the bore ensures a perfect concentricity, this combined with a progressively decreasing baffle thickness and maximized venting area significantly reduce bullet flight disturbance resulting in less yaw, higher BC, and improved accuracy. 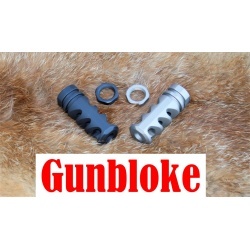 THE DOMINATOR Muzzle Brake Compensator features 5 large expansion chambers which dissipates then directs the gases to the side and rear through the precisely canted vents. 63mm OAL, 21mm dia, 80gr. 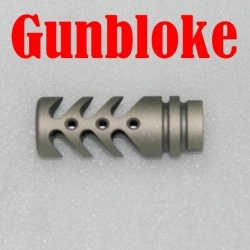 "THE ELIMINATOR" Muzzle Brake & Compensator provides maximum recoil reduction with reduced muzzle blast. The result of extensive research into muzzle gases and the effects of redirecting them for recoil reduction and accuracy enhancement. 3 large expansion chambers plus top venting trap and redirect gases to eliminate dust printing, muzzle rise, and back blast. 3 large symmetric baffles, each featuring 2 large horizontal ports & 1 smaller vertical ports, redirect a massive volume of gas away from the bore axis whilst reducing muzzle jump. 14x1mm or 5/8x24 thread featuring High pitch diameter tolerance class 3B threads machined in the same operation as the bore ensures a perfect concentricity, this combined with 3 symmetrical blast baffles redirect gas to the sides and upward delivering unparalleled recoil reduction while also minimizing muzzle rise and ground disturbance. 5/8-24 TPI thread featuring High pitch diameter tolerance class 3B threads machined in the same operation as the bore ensures a perfect concentricity, this combined with a progressively decreasing baffle thickness and maximized venting area significantly reduce bullet flight disturbance resulting in less yaw, higher BC, and improved accuracy. The main body is Machined from high strength steel & with a removable shield & spriral shield. The Triple-Tac Plus Muzzle Brake Compensator features 3 large expansion chambers which dissipates then directs the gases to the side through the precisely canted vents. Machined to suit your cal. please state colour & cal on checkout. 14x1mm thread featuring High pitch diameter tolerance class 3B threads machined in the same operation as the bore ensures a perfect concentricity, this combined with a progressively decreasing baffle thickness and maximized venting area significantly reduce bullet flight disturbance resulting in less yaw, higher BC, and improved accuracy. "THE LIGHTWEIGHT ELIMINATOR" Muzzle Brake & Compensator provides maximum recoil reduction with reduced muzzle blast. Machined from high strength Aluminium. 14x1mm thread featuring High pitch diameter tolerance class 3B threads machined in the same operation as the bore ensures a perfect concentricity, this combined with 3 symmetrical blast baffles redirect gas to the sides and upward delivering unparalleled recoil reduction while also minimizing muzzle rise and ground disturbance. The Quad-Tac-Plus Muzzle Brake Compensator features 4 large expansion chambers which dissipates then directs the gases to the side through the precisely canted vents. The main body is Machined from high strength steel & with a removable lightweight shield & spriral shield.